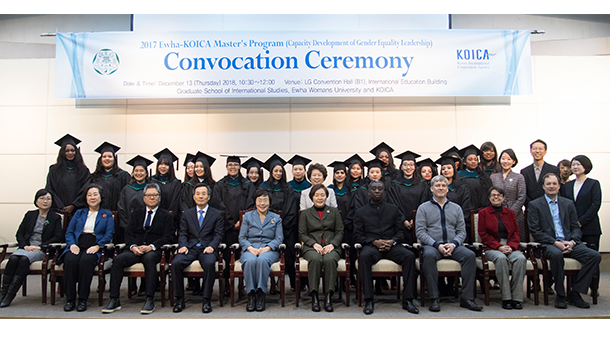 Ewha held the “11th EWHA-KOICA Master’s Program Convocation Ceremony” at LG Convention Hall in the International Education Building on Thursday December 13, 2018. This year, 20 students from 15 countries successfully completed their master’s program of Development Cooperation. They are female civil servants from developing countries chosen as scholarship students for the program with an aim to foster global gender equality leaders, and after graduation, they will serve as a specialist for diverse international cooperation activities in their country. In this ceremony, there were 160 attendee including President Kim, Hei-sook, Lee Mi-kyung, President of Korea International Cooperation Agency, Jang Bong-soon, President of ODA Education Center, professors of Graduate School of International Studies, officials of the International Exchange Promotion Association and families of students, and they shared joys and meanings of the commencement. The 20 graduates celebrated their commencement by singing Arirang together on the stage with K-POP style dances. Present Kim said in her congratulatory speech that the EWHA-KOICA program has been playing a pivotal role in spreading Ewha’s values of achieving gender equality through education to the world, and encouraged the graduates to plant and grow a seed of Ewha’s tradition after coming back to their countries. President of KOICA Lee expressed her intimacy by saying “As an alumna of Ewha, it is very moving to attend this ceremony,” and asked them to make efforts to promote exchanges with Korea in their countries. 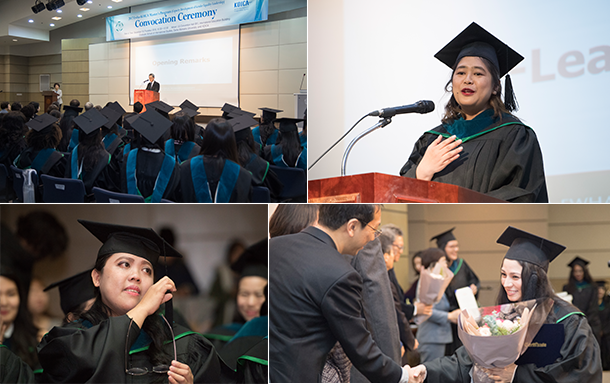 The graduates expressed their gratitude that they experienced Korea’s diverse cultures through the EWHA-KOICA program and had an opportunity to foster expertise that will contribute to international cooperation, thanks to outstanding faculty and systematic education programs, and promised that as a woman leader, they will enhance competitiveness of women after returning to their country. The EWHA-KOICA program co-operated by Ewha’s Graduate School of International Studies and the Korea International Cooperation Agency (KOICA) provides education programs specially designed for women leaders from developing countries, ranging over official development assistance (ODA), gender and development, and practice training courses for gender equality and women competitiveness enhancement (visit to national agencies including the Ministry of Gender Equality and Family, the Korea Institute for Gender Equality Promotion and Education, and field trips to factories of large-scale companies). Since 2007, the program has produced 265 graduates (including 8 students completing the program) from 50 countries, and the graduates have been working as civil servants, researchers, and NGO organizers across the world.